Various sizes and types of this extremely flexible, widely used packaging material, along with the dispensers that make shipping departments more efficient. Stretch wrap is a widely used material for securing all types of products and objects in virtually every industrial sector. Because stretch wrap holds loads in place, it can be utilized to bundle, stabilize, unitize and protect an extremely wide range of products of all sizes, from the containers of electronic accessories to full palletainers and large industrial machinery. Jewelry firms often use opaque stretch wrap because it protects and also cloaks the value of the shipment. Usually used with specialized dispensers, stretch wrap delivers several advantages. It is extremely easy to use, because it exits rapidly from dispensers and fixes in place automatically, requiring no extra action nor equipment to adhere. It holds loads firmly, while at the same time, not cutting into individual items or corners. We favor cast stretch wrap – one of two manufacturing techniques – because its use is quiet, while blown film – the other technique – makes a screeching sound as it exists dispensers and as the actual wrapping takes place. The sound during the use of blown stretch wrap with dispensers makes conversation difficult in confined areas. Often, stretch wrap is not stretched enough to secure individual items in a load or the load itself. This causes unstable loads. Our film is routinely stretched more than 200%, which means that 1 foot of film will extend to 3 feet. Based on the manufacturing technique, stretch wrap comes in two types – cast or blown film. Our bi-axially oriented, three-layer polypropylene, co-extruded cast film is manufactured on the most modern extruders in industry. And our product delivers consistent characteristics capable of delivering normal adhesion at temperatures as low as – 20° Fahrenheit. 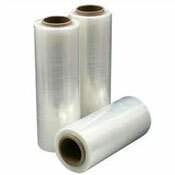 We provide rolls from 3 inches to 50 inches wide and from 1,000 to 6,000 feet long. Gauges range from 80 mils to 120 mils. We provide stretch wrap in a range of colors, including clear and black. 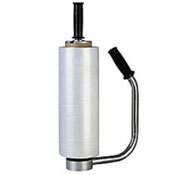 Several types of dispensers are available, from small hand-held units to large fixed units for working with large loads.